This "Historically Speaking" column appeared in the Exeter News-Letter on February 10, 2017. “Don’t believe everything you read,” goes the old saying. 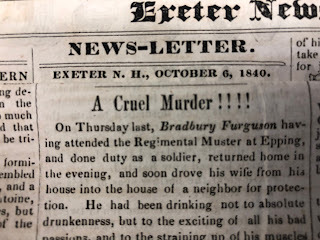 At the turn of the last century, Exeter had two local newspapers vying for attention: the Exeter News-Letter and the Exeter Gazette. Both tried to attract the attention of subscribers and accepted advertising from the pernicious patent medicine trade to finance publication. ‘Patent medicine’ is actually a misnomer. There were no patented medicines in the United States. There were, however, proprietary concoctions, derisively referred to as ‘nostrums,’ which Merriam-Webster tells us is, “a medicine of secret composition recommended by its preparer but usually without scientific proof of its effectiveness.” These were commonly sold at state fairs or by traveling salesmen. Patent medicines could come in many forms: syrups, ointments, bitters, powders, extracts, salves, pills, balms or liniments. Most had one thing in common – they did nothing to cure or treat illness. Of course, the nation wasn’t exactly used to finding relief with medical treatment. Dr. William Perry, who practiced on Front Street in Exeter, kept a book of his favorite prescriptions, which is now in the collections of the Exeter Historical Society. He began jotting down his treatments in 1850. The maladies he sought to treat are an odd mixture of common complaints, such as hair loss, mild rashes and bad breath, horse problems and very serious illnesses. As such, the reader needs to carefully determine whether the liniment recipe is for bald spots, lameness due to a failed harness or consumption. Probably these didn’t work particularly well anyway – except maybe for the lame horse. Perry treated “rheumatism and gout” with a mixture of carbolic soda, ginger, Sulphur, guaiac, turkey rhubarb and saltpeter. Thankfully, the patient was advised to take only one teaspoonful every other morning. Much more than that would have certainly made the rheumatism and gout an afterthought. Perry probably used more traditional hands-on medicine in his practice. Reassuring patients, prescribing heat or steam, waiting for a fever to break provided comfort more than actual cures. As his practice stretched into the era of germ theory, he would have encouraged sanitation, healthy food and rest, rather than medications. His prescription book indicates that he didn’t seem to overuse the most popular remedy of the time – opiates. Except for the occasional use of morphine for extreme pain or diarrhea, Perry doesn’t seem to have doped his patients into foggy oblivion. For roughly 50 years following the Civil War, there were no regulations required to manufacture or sell medications. Hucksters quickly worked out what the most common complaints were. The problems people had back then weren’t much different from what we have today, although they used different names. Probably no modern doctor has had a patient complaining of “chronic catarrh” – a stuffy nose, or “scrufola” – swollen glands. “Well Doc, I’ve had awful quincey since the weekend.” In all fairness, these seemingly small annoyances had the potential to kill a person. Congestion could become deadly pneumonia. Swollen glands could easily be tubercular and “quincey,” or sore throat, could be an early sign of diphtheria. Given that doctors couldn’t prevent or cure such afflictions, it’s no wonder people turned to miracle concoctions. A child’s persistent cough might be seasonal allergies, or it might be the beginning of deadly tuberculosis. 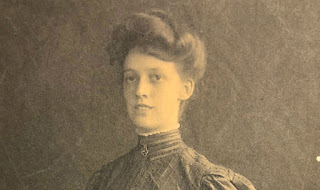 Exeter’s Dr. Edward Otis, a specialist in the prevention and treatment of tuberculosis, could only remind people, “we find that the four best preventatives for disease are fresh air, good food, cleanliness and cheerfulness.” Every little cough was a reminder that death was just around the corner. If Adamson’s Botanic Cough Balsam promised to stop the cough no one really wanted to know what was in it. Both the Exeter Gazette and the Exeter News-Letter were filled with ads for patent medicine. 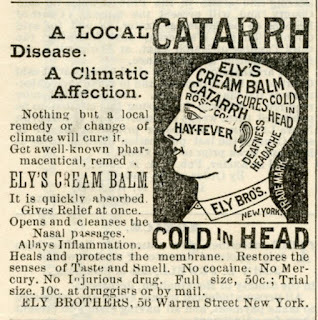 The Gazette, on January 4, 1895, ran 29 advertisements for a wide variety of ailments. You could buy Dr. Pierce’s Pleasant Pellets for stomach and liver problems, Johnson’s Anodyne Liniment for aches and pains or a mysterious tonic called, P.P.P., which promised to cure all skin and blood diseases along with rheumatism, syphilis, ulcers, sores, malaria, catarrh, dyspepsia, menstrual irregularity and poisoned blood – all through a combination of prickly ash, poke root and potassium. It was too good to be true, but why not give it a try? Ten years later, even after the Progressive movement began to question the safety of patent medicines, the Exeter News-Letter ran 23 patent medicine ads, including Piso’s Cough Syrup, which would cure consumption and had the additional benefit of tasting good. Regulatory legislation was passed in 1906 through the Pure Food and Drug Act. Marketers had to list the dangerous ingredients and could no longer make fabulous claims. Years of testing and lawsuits followed. P.P.P was found to contain 16% alcohol and only 1.32 grams of potassium iodide. It didn’t appear to contain any poke root or prickly ash. Piso’s Cough Syrup, just before the regulations went into effect, was tested to contain alcohol, chloroform, opium and cannabis indica (hashish). The company was good enough to take out the opium after it was exposed by Collier’s magazine in 1906. Many of the medicines weren’t overtly dangerous. Ely’s Cream Balm contained only liquid petroleum with small quantities of thymol and menthol, so it was basically just scented Vasoline. Most contained enough alcohol to allow ‘patients’ to have a nip in an otherwise dry town. It was no wonder Mrs. Winslow’s Soothing Syrup calmed teething babies – it contained morphine and ammonia. The American Medical Association would later list it under “Baby Killers” in a publication printed in 1911, Nostrums and Quackery. Fake cures, it seemed were just that, and the public was well rid of them. 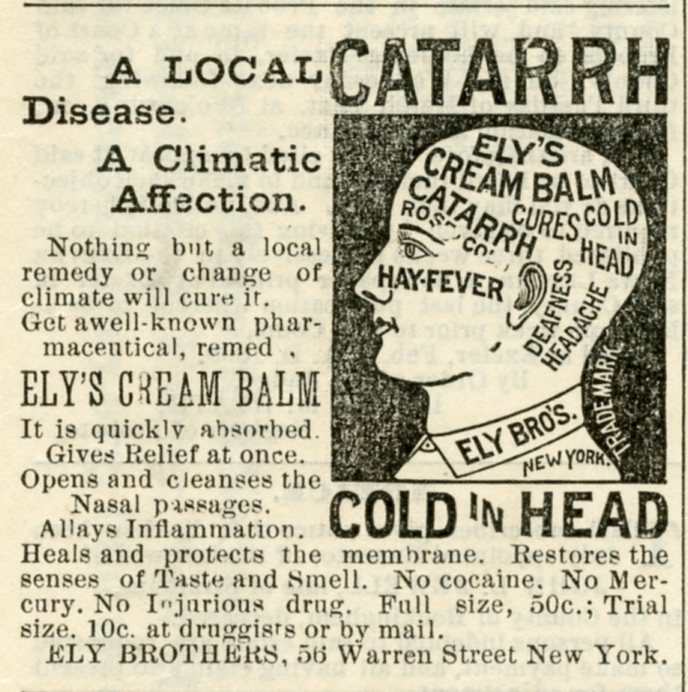 Image: Ely’s Cream Balm ran this advertisement in the Exeter News-Letter in 1899. Like most patent medicines, it promised to cure a variety of ailments.